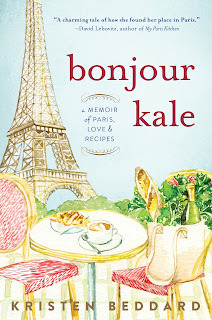 My review today is for Bonjour Kale by Kristen Beddard, a memoir about a new life in Paris, with a difference. Kristen meets her husband Philip in New York, but he was actually born in Geneva, raised in England, had a German passport and spoke fluent French. His work lands them in Paris, which she loves, but she also feels there are some things missing in her new life. The first is kale; the curly cabbage-like vegetable that can be eaten raw, cooked or juiced, was a staple from her childhood and is noticeably missing from markets, supermarkets and restaurants in Paris. The other thing missing is her sense of purpose. 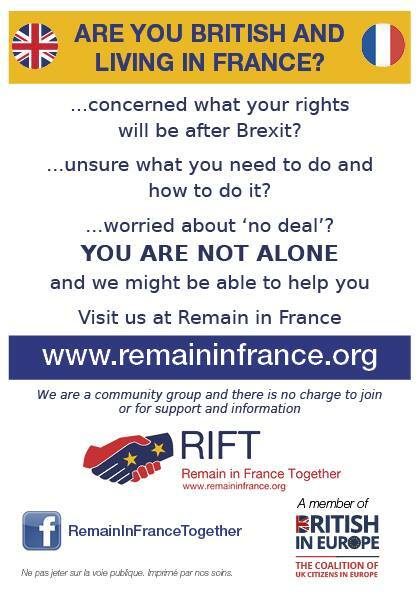 Her French is limited, she isn’t working and she misses her family and friends. This is when she decides she needs a project and that is to single-handedly bring kale to Paris. If there is one thing the French know, it is their food and I’ve yet to meet a French person who doesn’t have an opinion on how to prepare, cook or eat whatever food is being discussed (and in France food is always being discussed). To find farmers willing to grow kale, market vendors willing to sell it and restaurants brave enough to use it, was an enormous task when most of them had never heard of it. With determination and an ever-growing network of kale lovers on her side, it is a challenge she embraces and refuses to give up on. Maybe I have lived in France too long, or just that I prefer courgettes (zucchini) to brasicas, but I have to admit to never having eaten kale, however Kristen’s passion is so strong, her story so inspirational and the recipes she includes sound so delicious I’m off to see if kale has reached rural France. This memoir ticked lots of boxes for me; the funny settling in stories and mishaps of arriving in Paris, the food and market side to living in Paris and a story that is just a little bit different to other similar memoirs. I highly recommend it. 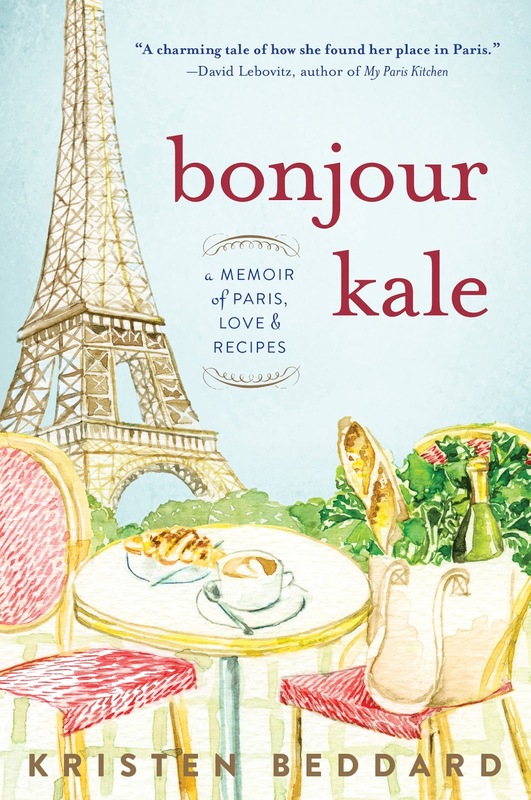 Bonjour Kale is published by Sourcebooks and available from Amazon in paperback. When Grace Hansen finds a box belonging to her beloved grandfather, she has no idea it holds the key to his past and to long-buried family secrets. In the box are his World War I diaries and a cryptic note addressed to her. Determined to solve her grandfather's puzzle, Grace follows his diary entries across towns and battle sites in northern France, where she becomes increasingly drawn to a charming French man and suddenly aware that someone is following her. Through her grandfather's vivid writing and Grace's own travels, a picture emerges of a man very unlike the one who raised her: one who watched countless friends and loved ones die horrifically in battle; one who lived a life of regret. But her grandfather wasn't the only one harboring secrets, and the more Grace learns about her family, the less she thinks she can trust them. Grace and her Grandfather shared a close relationship, close enough for him to set her a puzzle and know that one day she would work out his secret and help to put right what he couldn’t. With his war diaries and cryptic clues Grace heads to France, alone, hoping following in his footsteps will make solving the mystery easier. Visiting the memorials, cemeteries and museums that are in abundance in northern France, Grace meets Pierre, a welcome friendly face, as she soon realises she is being followed. Just what is in her Grandfather’s diaries to cause such interest? This book is partly set in the 1990’s following Grace as she tries to work out the clues she knows her Grandfather has left for her, part narrative of his time spent fighting in the First World War and part extracts of his harrowing war diaries, all cleverly woven together. We get a firsthand account of everything life in the trenches threw at the soldiers including the discomfort and dirt, death and depression, friendship and camaraderie. Young Martin Devlin is often angry and very different to the loving Grandfather Grace remembers. There are plenty of twists and turns and every time Grace gets closer to solving a clue, something or someone crops up and the mystery deepens, leaving me wondering who can she trust. The further into the book I got, the more difficult it was to put it down. This is the third historic novel I have enjoyed from MK Tod, but the added sense of mystery in this novel has made it my favourite. Read my review of Unravelled here. Read my review of Lies Told in Silence here. Living with a teenager it is all too easy to slip into a routine during the school holidays; he gets up at midday, breakfast rolls into lunch, an afternoon bike ride with us is frowned upon as he’d rather watch YouTube, so more often than not the only time spent together was dinner. The opportunity to review Longère Louise from a cyclists perspective gave us a very welcome couple of nights away, as a family, just before packing Ed’s suitcase and taking him back to school. 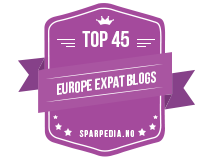 Situated to the east of Poitiers in the Vienne department, we found ourselves in an area we had yet to discover, despite being only a two hour drive from home. On our way there we parked in the village of Lathus, had our picnic lunch and set off on the bikes for a 40km circuit to Montmorillon. I’d always wanted to visit this town, feeling a kind of spiritual connection to a place that not only calls itself the city of writing, is full of little bookshops, but has it’s own speciality almond macaron too. The end of the school holidays might have been close, but I wasn’t giving up on summer yet. The cycling was along pretty back roads with a few hills but nothing too challenging, following the Gartempe river valley, which disappointingly was often hidden from view. Montmorillon with it’s old stone bridge (parts of it dating back to 14th Century) separating the old town on the hill with the new town was just as pretty as I had hoped. We took lots of photos on the bridge before wandering slowly around the old town, whose streets were too narrow and steep for cycling. Unfortunately for us it was a Monday and there wasn’t a lot open, but we did get to peer in the windows at the pretty displays of the bookshops that were closed. I had also read that the church was worth a visit and was pleased to see the door was open. I propped my bike up by a tree and was just about to trot inside (with my clomping hoof-like cycle shoes) when something about the sombre mood of a small group of people gathered in the shade of a tree made me think ‘funeral’. Almost immediately the hearse arrived and I was glad I hadn’t been stuck inside dressed in purple lycra. It was time to make a hasty retreat and go searching for macarons. With the disappointment of the bookshops being closed and the church being otherwise occupied, my hopes were pinned on the macarons; a delicious sounding treat made with egg whites, sugar and ground almonds, with a moist centre that is top secret. However, every boulangerie and patisserie we saw was closed and we couldn’t find anything on the town centre map to point us in the right direction of the family business that has been making them for generations. Disappointed again, we cycled out of town. As soon as we arrived at Longère Louise our spirits were lifted. It was beautiful, looked tiny from the outside, but with space for the bikes in an inner hallway, a lovely family-sized table in the heart of the kitchen, two good-sized double bedrooms and an upstairs lounge Ed soon occupied, it wasn’t short of anything, except headroom – poor Adrian was just too tall for some of the doorways and low beams, but nothing that wearing a cycle helmet couldn’t fix. I found everything I needed in the kitchen to cook our evening meals and pasta salad lunches, in fact I think it was better equipped than my kitchen at home and most of our meals were eaten out in the secluded courtyard. The cottage is in a quiet hamlet, but only three kilometres (an easy cycle ride) from the village of Liglet where we found Le Sapin Vert, a bar/restaurant under new and friendly ownership and the boulangerie/general store. Day two was our big bike adventure, crossing the border into the Indre and discovering the Brenne national park. This area of over 3000 manmade lakes was once a forest, but with the wood used for iron extraction the first lakes were made in the Middle Ages for carp rearing, which continues today. Most of the lakes are privately owned fish farms, 60% of the fish raised are carp and are mostly exported. Our 70km route followed a voie verte cycle way along an old railway line from the town of Le Blanc, before picking up a marked circuit that takes you around the lakes. The railway line was quiet, tree lined and shady, and the dry summer meant the first of the leaves had already started to fall, crunching under our wheels along with the popping of crushing acorns. Once out into the flat, open national park we cycled past straw coloured fields where the grass was as dry as hay and the pale coloured cows stood together in the shade of the trees. The air was warm and pine scented, with plenty of shade from oak and pine trees and I could smell the cool freshness of a lake as we approached. The lakes are home to water lilies, herons, egrets, swans, coots, turtles and that was just what we saw. What there wasn’t much of though was picnic tables or benches, probably because most of the lakes are privately owned. We also seemed to pick one of those days where every village bar and boulangerie we passed was closed. Thankfully we found somewhere with a bench to share, and tucked into our picnic pasta pots. It was a lovely, family day out, even if I was left trailing at the back most of the way. We might only have been away from home for two nights, but it felt like a proper holiday and I am happy to recommend Longère Louise to anyone looking for a Vienne holiday. Click here to read my full review for FreewheelingFrance with booking information. Longère Louise is priced from £350 per week. Farewell to another summer, the longest summer we have had in France. 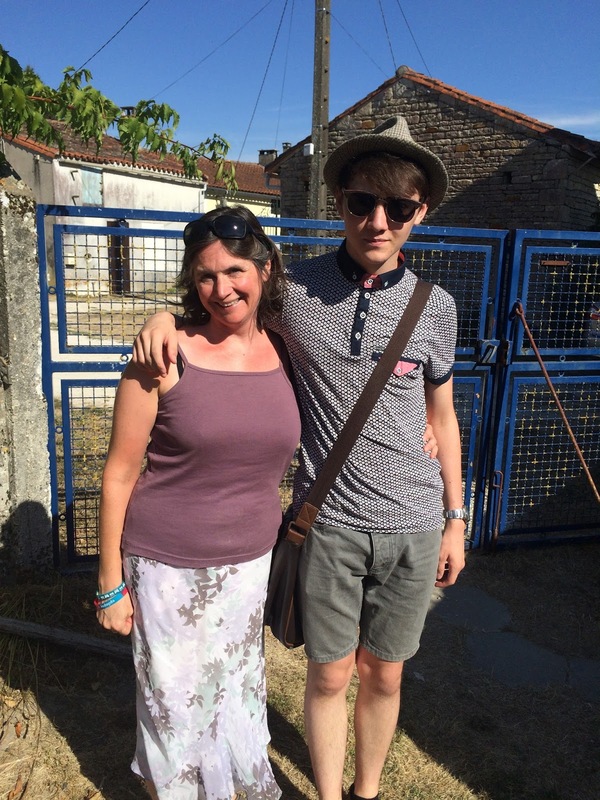 Ed finished lycée on 8th June, twelve whole weeks ago, which was fantastic, but I only hope he will remember how to study. His suitcase has lain half packed on his bedroom floor for a few days and we will soon be back into the routine of dropping him off early on a Monday morning, collecting him on a Friday afternoon and washing his clothes and bedding all weekend. This August has been the hottest, sunniest and driest we have experienced in twelve years of living here and it was with some trepidation we opened the shutters this morning. Adrian has a theory that the weather on the first day of a new month has an affect on the rest of the month. We were really hoping for blue sky rather than rain clouds, allowing us to carry on with our summer cycling routine, rather than accept Autumn is here. It was perfect. Warm, no wind and although sunny, not too hot either. Leaving Ed to enjoy his last weekday lie in, we set off to market, by bike. It is at this time of year that the Charentais melons are at their best and luckily Adrian is happy to carry four in his bike pannier. Even an extra one, popped in as a cadeaux by the stallholder wasn't a problem. Next stop was the boulangerie stall for two croissants, then on to the Auberge duCheval Blanc for a coffee and catch up with the friendly owner. Market day is a great day to people watch; the older lady with her old bike, complete with wicker shopping basket tied to the back, the stall holders planning a beer together after market, the never ending queue of patient shoppers at the fish stall and the cyclist with two baguettes poking out of his backpack. I can only hope the weather stays good enough for us to continue cycling to market every week. Much as I dislike la rentrée (back to school/work), I do think September makes a better new year than January. I'm ready to turn over a new page and set some goals in much the same way Ed is ready to return to school. Life as a weekly boarder at the intern is what he says he has missed most this summer, but it's my home cooking that he says he’s going to miss now he's back at school. Having dropped Ed off, Adrian and I will enjoy a quiet meal for two this evening, with a Charentais melon starter and glass or two of wine, to toast what has been and will continue to be another great summer. 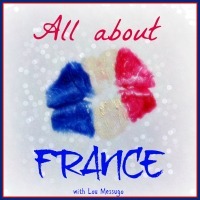 This post has been linked to #AllAboutFrance at Lou Messugo blog.